Photos have emerged of a "new" Kim Jong-un hairdo. Simply put, it is spectacular. But how did we get here? When did this happen? Let's take a look back at Kim's coifs from over the years. The world didn't always know that this ruthless dictator had such oppressive hair. For example, in the original backstory trailer for the 2010 video game Homefront, an actor played Kim Jong-un that didn't resemble him, because, at that time, few knew what the heck young Kim—or, more importantly, his locks—looked like. See, in 2010, the last known photo of Kim Jong-un was when he was a kid. That's why Homefront initially had its Kim Jong-un with erroneous hair. This guy! This is not the Supreme Leader. It is a supreme mistake. But hey, the game's developers didn't know. And when the world finally got a good look at Kim Jong-un when he was wheeled out for a public appearance, the game's makers made the necessary haircut changes. But Kim Jong-un wasn't born with Kim Jong-un hair. In 2010, South Korea paper Chosun.com showed the dramatic change Kim Jong-un underwent to get a DICTATOR 'DO. Look how he goes from a fresh-faced kid who loves the Chicago Bulls to a ruthless ruler who loves the Chicago Bulls. Of course, as Asahi pointed out, the haircut isn't a Jong-un original. Rather, the style was designed to remind folks of his grandfather Kim Il-sung, the founder of North Korea. After Kim Jung-un assumed power in 2010, the brutal regime continued in North Korea, along with bellicose threats and hermit kingdom hair. But for those early years in power, Kim's hair was floppy. This is light on the flop. Here's some heavy flop. But that began to change last year. I blame hair wax. The above photo dates from April 2014. Or the movement when Kim Jong-un went from floppy to trapezoid. More photos surfaced earlier this year, like this AFP photo that appeared on The Japan Times. Kim Jong-un doesn't need no furry cap! So think of dictator hair in The Times photo as an overture. That's what I'm doing. Right now, actually. Oh my. On the internet, people are saying Kim Jong-un got a new haircut. I'd like to think he got a new blow dryer. But this is very important. Don't ask me how it's news. It's news! Just ask CNN. This is a developing story. And CNN would know! 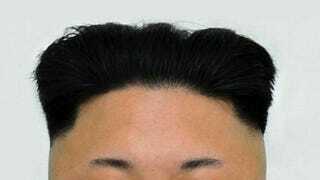 Kim Jong-un's hairstyle has drawn a slew of comments and comparisons. Because, like I said, this is very important. Kim Jong-un, you've come so far. We're all counting on your hair. Don't let us down.